Styrofoam is the trade name of foamed polystyrene, a type of plastic used in the housing industry as an insulator. Polystyrene has a wide range of uses, from auto parts to computer housings. When injected with gases during manufacturing, foamed polystyrene becomes lightweight with about 95 percent air. This product is a poor conductor of heat, so it is used in drink holders and as insulation. Styrofoam is also used in a variety of packaging materials. Many people have concerns about how well plastics, including polystyrene, degrade over time. Polystyrene breaks down so slowly that it is not viable as a biodegradable product. Most of the polystyrene that ends up in landfills will still be there 500 years from now, according to the Environmental Action Association. A study by the U.S. Environmental Protection Agency, however, says that polystyrene food packaging only accounts for 0.5 percent of all solid municipal waste when measuring by weight. While a concern in landfills because of its near nonexistent biodegradation, polystyrene is of greater concern when found outside of landfills. The litter is unsightly and, unlike metals that command a price with recyclers, there is little economic incentive for people to collect the trash. In addition, polystyrene breaks into pieces easily when crushed. Wildlife may try to browse the pieces, mistaking them for food. Ingestion could lead to death. 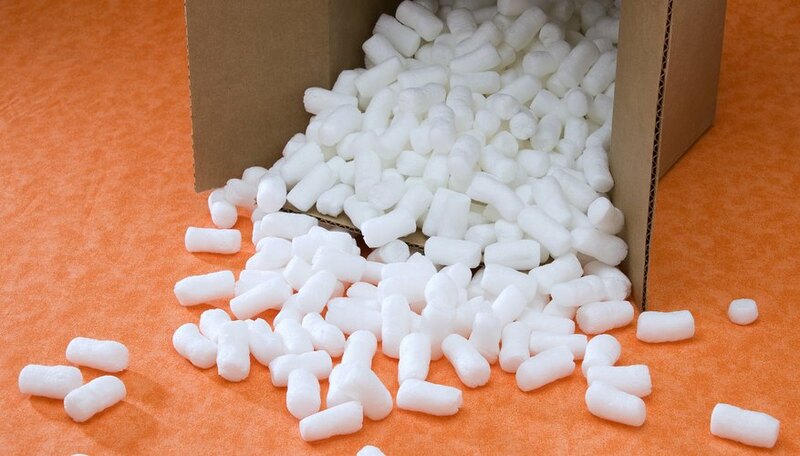 Some polystyrene products, such as those made into packaging peanuts, may be reused without remanufacturing them. Although the means exist to recycle polystyrene, the cost to do so is higher than producing polystyrene in the first place. Without a recycling option, much of the polystyrene in use continues to end up in landfills. Some researchers are developing replacement products for polystyrene. Made of corn-based ingredients, these products may be more environmentally friendly and may biodegrade rapidly when disposed. Other researchers have experimented with turning waste polystyrene into a different product entirely. They heat polystyrene to temperatures as high as 520 degrees Celsius (968 degrees Fahrenheit) in the absence of oxygen in a process called pyrolysis. This breaks down polystyrene into styrene, a substance readily consumed by some bacteria. As a byproduct, the bacteria produce polyhydroxyalkanoate, or PHA, a recyclable plastic that can be made into disposable cutlery, medical devices and shampoo bottles. Korpella, Robert. "Is Styrofoam Biodegradable?" Sciencing, https://sciencing.com/styrofoam-biodegradable-22340.html. 25 April 2017.